NOTE: My original post, originally published in January 2013, continues to be one of the most viewed on the site. Android and Apple have enjoyed an estimated 98% market share between the two, and many of my earlier projections regarding this market appear to have been borne out. 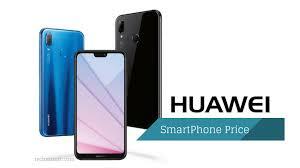 However, the smartphone market has now matured to the point that it is at a strategic inflection point which has major implications for the future of this market and the major competitors. The signs of a dangerous strategic inflection point in the global smartphone market have been evident for some time: the rapid rise of domestic Chinese competition combined with the predictable end of the Western consumer fascination with “the next smartphone.” Five years ago, Samsung Electronics, the South Korean technology giant sat atop the Chinese market, selling nearly one of every five devices there. Today, Samsung is an also-ran, controlling less than 1% of the world’s largest smartphone market. Samsung has trimmed local staff and last month closed one of its two Chinese smartphone factories. Surely, Apple must have been aware of this and the growing number of much lower cost domestic Chinese competitors that were already hammering Samsung. Apple’s release of a lower cost iPhone, the XR, in Asia in October 2018 appears to have been a case of too little too late. Sales of the device have been disappointing in both Japan and China, and Apple has been relegated to offering “trade-ins” to camouflage slashing the price of the XR. Apple had ample warning over at least a five year period. Meanwhile, I sensed a very different kind of maturation of the smartphone market in North America and Europe. In what I like to call the smartphone market “Star Wars” phenomenon, each new generation of smartphones was greeted with a hysteria that was only paralleled by the Star Wars craze. This simply could not continue indefinitely. Beginning in 2017 it was apparent the smartphone market as a whole was already shrinking, and there was significant anecdotal information in the media that smartphone hysteria was waning, if not publicly available hard data. I began having discussions about this with Tim Bajarin, one of the top Apple analysts. As Apple moved to launch the iPhone X and broke the $1000 price point barrier it encountered clear if perhaps not overwhelming evidence that the smartphone market was softening: more people chose not to upgrade their phones. I like to say that the last major feature consumers seemed to want/need was water resistance, as so many had already experienced the disastrous “toilet drop.” I view the Bluetooth earbud phenomenon as a distraction and perhaps a hint of the coming change. Samsung flirted with water resistance as early as the Samsung Galaxy S5, perhaps because water resistance had become a standard feature in the Japanese market. By 2018, water resistance was standardized, and the market began experimenting with “the next big thing” for phones, folding screens. WTF? It was clear to me that the smartphone market had run out of gas, and was undergoing rapid maturation, as phones were no longer fascinating and novel, but just simply commodity devices. To my mind, and IMHO, this has been a case study in a classic “strategic inflection point” that was missed by both Samsung and Apple. Samsung might be forgiven for being the first to cross into the inflection point, while the media was still promoting “the next smartphone” hysteria, and not yet recognizing the sense of the market. Apple has no such excuse. The rapid maturation of the smartphone market should have been foreseen by Apple. Apple’s most disturbing move was the decision to increase pricing rather than delivering greater value, at exactly the wrong time. The crucial rhetorical question is what are the larger implications for Apple’s future business? In one of the most interesting high tech scenarios in years, the “smart mobile” OS (operating system) market is shaping up to be a classic Battle of the Titans. Key strategic issues, theories, speculation, and money, lots of it, are making this a great real-time strategy and marketing case study for management students of all ages (smile). So as Dell prepares to fade into the sunset, get yourself a drink of your choice, and some popcorn, sit back and watch it all unfold. The best metaphor I can apply to this might be a “destruction derby” featuring at least two players, or perhaps a bizarre multidimensional Super Bowl or Rugby World Cup match, with four teams on one playing field with four goal posts at each cardinal point of the compass.. At the moment all four teams are tackling, passing, and running at each other in a confused pile. There are scrums, rucks and mauls in multiple locations. Two competitors, Google and Apple appear to be winning. The other two, Microsoft and Research in Motion, are pretty banged up, but still playing. The key question is whether Microsoft or RIM, will be able to establish a third mobile OS to a survivable market position. It is not at all clear that either can do so at this point. The market is also speculating that mobile hardware market leader Samsung, is possibly considering making its own play by creating its own mobile OS ecosystem. While this may seem far fetched, this kind of vertical integration seems to be making a resurgence as a strategic move, after having been discredited. Then there is the perennial Nokia, who has seemed to be on death’s door, but may be coming back. As a strategic partner for Microsoft, Nokia’s fate may have a huge bearing on Microsoft’s strategy to reinvent itself as the PC goes into atrial fibrillation. Will Amazon enter the fray with its own smart phone entrant, and if so, with whose OS? 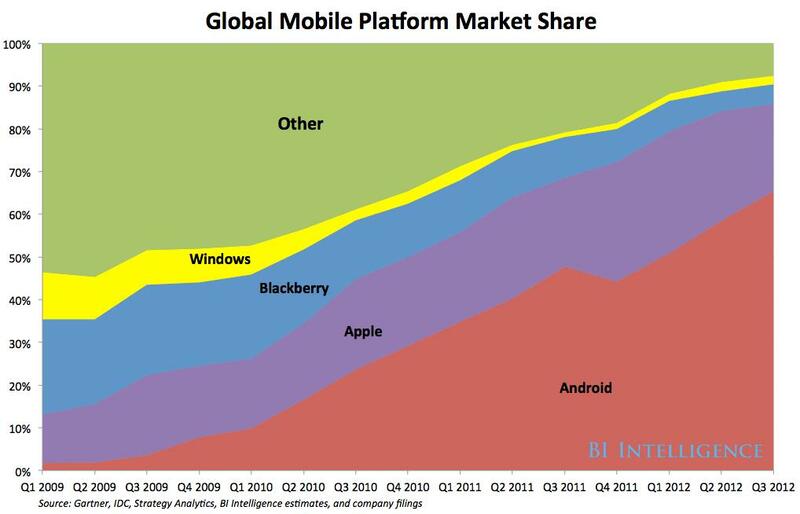 Will Research in Motion and the Blackberry be able to achieve a survivable market share, or is RIM already a walking zombie? The argument in favor of a third platform is straightforward and compelling: A new, robust competitor will prevent the dominant platforms from growing complacent or stifling innovation. Apple and Google are pretty happy with the status quo. Consumers are probably not consciously pining for a third mobile platform. Developers would happily get behind a third platform if it widened their revenue streams. Amazon has the most potential to upend the market: A smartphone would be a natural extension of Amazon’s distribution empire, and its Kindle Fire tablet play. Unfortunately, the most recent E-reader forecasts show them in sharp decline as growth in full-functional tablets squeeze them out. Amazon has 106 million unique visitors accessing its sites, many of them with credit cards on file. Samsung is a dark horse: Its dependency on Android may become a liability and push the South Korean manufacturer into the platform business. Samsung’s strength is its hardware sales prowess — Samsung shipped over 56 million smartphones in the third quarter of 2012. 1. The time tested 1976 Boston Consulting Group (Bruce Henderson) “rule of three and four.” In a stable mature market there can be no more than three surviving competitors, the largest of which can have no more than four times the share of the smallest of the three. Here, the question is whether a third competitor can successfully emerge at all? 2. Barriers to market entry. Former Intel Marketing VP, Bill Davidow‘s book, Marketing High Technology, An Insider’s View, still considered the standard on the topic, suggested his own metric for a barrier to a new market entrant, or even a competitor just struggling to survive the market shakeout. The market entry barrier rule of thumb in dollars is three-quarters the most recent annual revenue of the market leader. In this case, that is a very big B number… Microsoft has the bucks, but is it just too late? 3. Vertical integration. Rumors of Samsung introducing its own mobile OS seem implausible, but hey Nvidia just announced its own gaming console to compete with Microsoft, Nintendo, and Sony. 4. Resources and capabilities. It is necessary to consider the respective resources and capabilities of each of the many direct players, and those playing in related markets that bear on the mobile OS market. 5. Related markets, new markets, peripherally involved competitors and products which all could play a role in the eventual outcome of this. The integrated Internet HDTV market is only one example. Featuring Apple, Microsoft, Google, and Samsung, and the HDTV manufacturers, it could influence things. What if Amazon were to vertically integrate and introduce its own smart phone? This is the hairball of this Century so far. Are you all still with me, here?